Many have heard about the Erie Canal as a youngster, “There was a mule and her name was Sal - 15 miles on the Erie Canal.” It started operating in 1825 between the Hudson River and the Erie Canal at Buffalo. However, few are aware that the Ohio & Erie Canal, built between 1825 and 1832, brought Ohio out of the wilderness into the third most populous and one of the richest states in the nation. It was George Washington who first suggested a canal linking Lake Erie to the Ohio River as a national system of canals. Ohio governors during the late 1810s, Thomas Worthington and Ethan Allen Brown, supported such internal improvements. On December 11, 1816, Governor DeWitt Clinton of New York wrote the Ohio legislature of New York’s willingness to construct the Erie Canal without national help. He asked Ohio to join him in such an endeavor. Brown convinced the Ohio legislature in 1820 to establish the Ohio Canal Commission if the federal government would either sell or donate land to the state. Its purpose would be to hire an engineer to survey a route connecting Lake Erie with the Ohio River. Unfortunately, the U.S. government refused to provide funding, and no survey was accomplished. In 1822, the legislature ignored the lack of federal help and created such a commission anyway. It hired James Geddes, an engineer who had worked on New York State’s Erie Canal, to survey and design the best routes. He suggested two. Besides one running from Lake Erie to Portsmouth on the Ohio River, he proposed a second one called the Miami and Erie Canal. It ran initially from Cincinnati to Dayton then was later extended to Maumee (near Toledo), Ohio. Financing for the two Ohio canals resulted from acquiring loans. At first, these came from bankers and businessmen from East Coast states such as New York and amounted to $400,000. The initial construction cost was estimated at 2.3 million dollars. The actual cost of 41 million dollars, including 25 million for loan interest, nearly bankrupted Ohio’s state government. The canal was divided into 110 sections , varying in length up to a maximum of 20 miles. The commission advertised for bids from private contractors. About 600 bids were received with the state usually accepting the least expensive ones. Contracts were for grubbing and clearing, mucking and ditching, embankment and excavation, locks and culverts, and puddling and protection. Many of the first chosen contractors proved to be inexperienced and unreliable. Selected contractors frequently underbid and walked away from the project rather than finishing their work and paying their labor force. As bidding improved, better contractors were hired, and the situation resolved itself. Labor shortages were also affected by the building of the Pennsylvania Canal and construction of the National Road. Building the canals was backbreaking work accomplished mostly by using picks, shovels, wheelbarrows, and mules. At its peak, 4,000 workers were employed. Many of these were German and Irish immigrants. The Germans worked on the locks while the Irish did the earthworks. Those from Ireland and Western Europe designed engineering systems. Typically, workers were paid $8 a month for 26 days which ran from sunrise to sunset, food, a shanty, and two jiggers of whiskey a day. Wages fluctuated by area and demand finally rising in 1831 to as much as $15 a month. Malaria was a major problem. The first ground was broken on July 4, 1825 at Licking Summit near Newark, Ohio. Laws required certain specifications be met. The canals were to have a minimum width of 40 feet at the top, 26 feet at the bottom, and a minimum depth of four feet. However, these limits were often exceeded as it was cheaper at times to do so. The towpath was ten feet wide. Once trenches were dug, the canals were lined with sandstone. Most canal locks usually were composed of sandstone or limestone. A few privately owned ones were composites lined with wood. However, some were made solely of wood. They operated like hydraulic elevators. The lifts averaged 6 to 12 feet per lock. Flooding severely damaged locks, walls, and towpaths requiring extensive repairs. To prevent problems due to freezing, Northern Ohio canals were drained dry, except for a foot of water, in late November then repaired during the spring. In Southern Ohio, the canals remained opened. By 1832, the Ohio and Erie Canal was complete. The Miami and Erie Canal required an additional 12 years to finish because initial state funding had only taken that canal from Cincinnati to north of Dayton. The required funds to complete the job were earmarked in 1830. Eventually, Ohio’s entire canal system consisted of 308 miles with 146 lift locks over a rise of 1,206 feet. Five feeder canals added 24.8 miles and six additional locks. The first canal boat on the Ohio & Erie Canal left Akron, Ohio on July 3, 1827. It traveled through 41 locks and more than three aqueducts along 37 canal miles arriving at Cleveland on July 4. Four types of boats were used depending upon their purposes. Packets boats were for passengers while freight boats carried between 60 to 80 tons of goods. Combination boats served both while state boats were used for maintenance. Canal boats were usually maintained by their owners. They averaged 78 feet long, slightly over 14 feet wide, and had to meet canal specifications. The average cost for such a boat was $2,100 including the mules for towing. Mules were used primarily to haul freight boats while two horses towed packets. It was usual for 12-year-old boys to be hired as hoggees (towpath walkers) to lead the animals on the towpath. They usually received a salary of $20 per month. Crew duties averaged four to six hours walking the mules for freighters and 15 mile stretches for packets with horse teams replaced in relays. Towpath walkers were responsible for inspecting locks, aqueducts, dry docks, and the towpaths for signs of wear. They watched for breaks in the canal to see that they were repaired quickly. They also hauled out sinking boats and rescued small children that fell overboard. The captain and his family lived on most boats in the rear cabin which had simple furnishings such as a coal stove, stacked bunk beds, tables, chairs, oil lamps, and a chamber pot. They had to climb down through a hole in the roof to reach their cabin. The crew on packets, besides the hoggees, included a cook, two steersmen, and a helper. When the animals were changed so were the boys. Both rested in the middle compartment of the boat set up as a small barn. Freight canal boats had freight sections in forward and aft cargo bays. Passengers and crew were sometimes up front as well. Additional cargo could be carried on the top roof up to a three foot height. Another type of job that developed was that of lock tender. He worked the locks and insured traffic moved smoothly. At strategic points along the canal called weigh locks, boats were charged tolls depending on the type and weight of their cargo. Weigh locks were similar to lock chambers with gates at one or even both ends. For operation, once a boat was admitted, the gates closed and all the water was run off. After that, the boat settled on a very large scale that determined its loaded weight. Boats were weighed when they were empty at the season’s beginning. With their empty weight known, the net weight was determined by subtracting the empty weight from the total amount to ascertain the cargo weight. The Ohio & Erie Canal created vast markets for farmers making it possible to send their products to New York City via Lake Erie, the Erie Canal, and the Hudson River or to New Orleans via the Ohio and Mississippi Rivers. By 1860, Ohio led the nation in agricultural output with corn, wheat, and hogs being major products. It fostered the growth of numerous small towns along the waterway such as Canal Fulton, Navarre, and Bolivar. Many of these had mills since the canal would supply water power. Besides collecting tolls, selling water rights was one way the canals made money. It caused the blossoming of Massillon, Akron, and Cleveland. They became nationwide leaders in the shipping and production of wheat, corn, coal, and lumber. For example, Buffalo, New York merchants increased their purchases from Cleveland’s wheat market from 1,000 bushels to more than 250,000 within one year of the canal opening. Cleveland turned raw materials into steel and petroleum products. The canal system allowed Ohio’s residents and businesses to import from northeastern factories less expensive manufactured goods. No longer were all clothes sewn on family machines. Instead, many were produced via mass manufacturing. Coffee, sugar, and window glass cost much less. Most canal freight traffic occurred between 1827 and 1861, peaking between 1853 and 1855. Over the next five to six years, half of the freight business was transferred to trains. After the Civil War, it was apparent the railroads would replace the Ohio & Erie Canal. Trains ran all year and carried more freight. They initially ran at 10 mph rather than the canal boats’ speed limit of 4 mph. Floods, snows, and ice were less likely to affect a toll on them. However, they were not without drawbacks. They often broke down and operated only during daylight until after the Civil War. Most canals remained in operation until the late 1800's with the Ohio Canal Commission operating until the early 1900's. Maintenance was always a major problem. 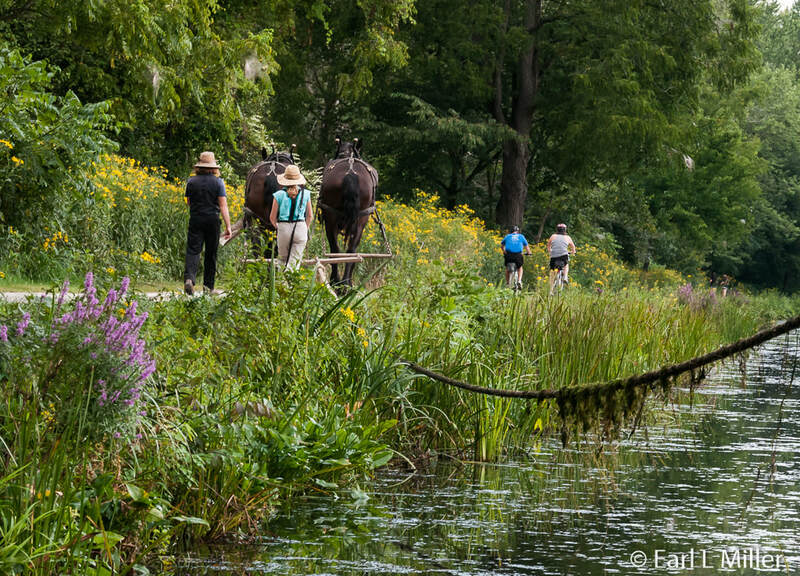 Keeping the canals weed free during the summer months required constant work. Retaining walls suffered from heavy rains, and poor construction required frequent repair. The Commission leased the canal to private operators for several years. Unfortunately, most of these operators never made repairs. When the state resumed maintenance, they used maintenance crews and boats to do the work, but this was not successful. Due to increasing maintenance costs, canal expenses outgrew its revenue.This caused areas of the canal to cease to exist. By 1911, most of the canal’s southern portions were abandoned. After their repair in 1904, those areas that existed were primarily used for pleasure boating. 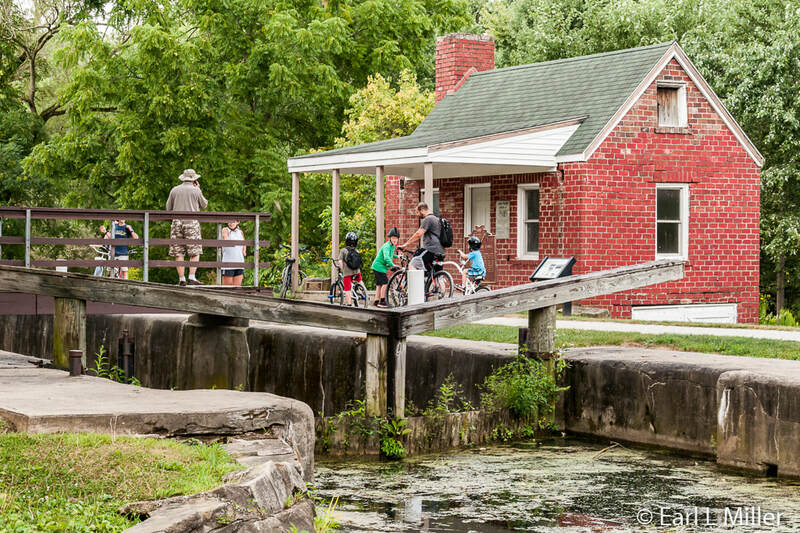 While most of the Ohio & Erie Canal consists today of some dried-up ditches, overgrown locks, and a few short distance waterways, you can visit parts of it in Northeastern Ohio. For example, in Canal Fulton you can take a 55-minute ride on the St. Helena III freight canal boat. 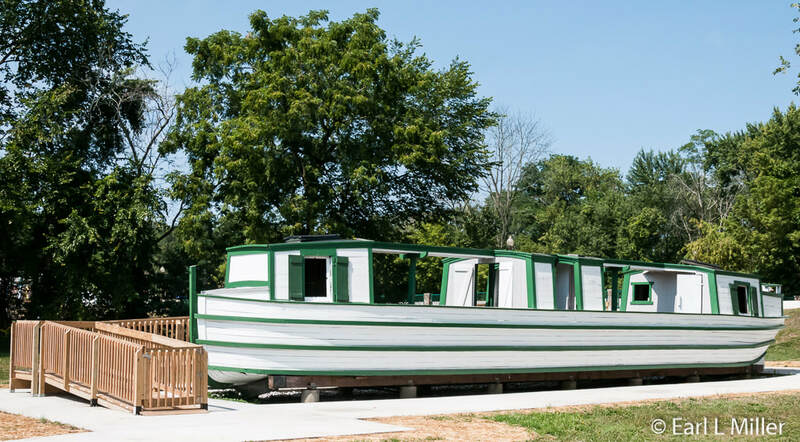 At Roscoe Village, you can board the Monticello III and take a packet canal ride. The Canal Visitor Center at Cuyahoga Valley National Park has summer canal lock demonstrations. A portion of the canal in Akron serves as a water supply for local industries. During late 1996, the canal from Zoar to Cleveland was designated as a National Heritage Corridor. The Ohio and Erie Canal Towpath Trail, composed of crushed limestone, runs for 75 miles starting at a point just south of Cleveland. Western Ohio has few reminders of the Miami and Erie Canal. However, the town of Piqua at Johnston Farm and the Toledo Metroparks system provide canal boat rides. Canal Fulton was the compilation of three towns. Milan was formed in 1814 along the banks of the Tuscarawas River. When plans were in place for the Ohio & Erie Canal, Fulton was created in 1826. It had a post office, three warehouses, two taverns, two stores, and seven houses. It also had several saloons and boarding houses. It was renamed Canal Fulton in 1832 which was the same year the hamlet of West Fulton was created. In 1853, Canal Fulton absorbed Milan and West Fulton. On a visit to the town today, look for large structures which were formerly grainhouses. At one time, six such warehouses existed, some as high as 60 feet, to store wheat before shipment. Farm wagons, from as far away as Mansfield and Ashland, lined the roads leading to Canal Fulton with grain to be shipped on canal boats. The warehouse winch beams jutted out over the street and canal. 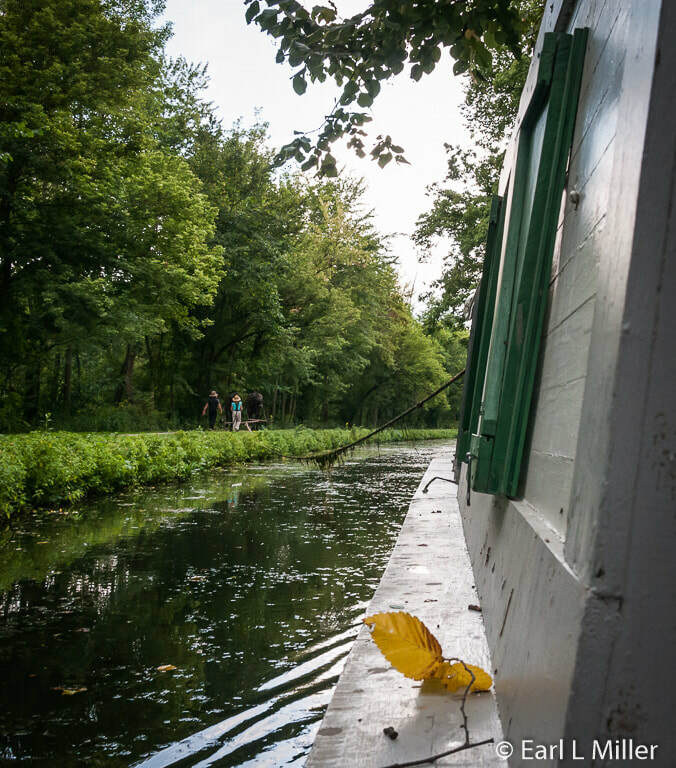 During the canal’s peak years of navigation, up to 100 boats a day traveled through Canal Fulton. Visitors also view saltbox type houses. Many of these have log walls from their early cabin days. Being economical to build and heat, many early coal miners and those connected with the canals used them as residences. The Baltimore & Ohio Railroad ran through Canal Fulton in the late 1850s. However, the railroad station was not built until after the Civil War. After the canal period, the coal mines kept the area alive in the late 1800's. Coal was discovered in 1865. At one time, more than 30 mines in the region, with six in town, produced high-grade hard coal attracting immigrants from Scotland, Wales, Northern Ireland, and later from Germany. Adding to the economic base between 1870 and 1895 were such businesses as the Canal Fulton Pit Car Works (built mine cars) , the Fulton Machine Company, and the Fulton Tool Works. The town’s growing prosperity was hindered by other problems besides the decline of the canal and coal industries.The 1904 flood caused major damage to buildings lining the canal. The 1910 fire destroyed 10 businesses on Canal Street. In the early 1900's, the coal mines became depleted. Because of the loss of industries and mother nature, a decline in population occurred from the early to the mid 1900's. During the latter half of the 1900's, Canal Fulton benefitted from suburban sprawl and become a bedroom community for Massillon, Canton, and Akron. This allowed Canal Fulton’s population to steadily grow. Today, retaining much of its historic character, Canal Fulton has more than 90 buildings as part of a historic district. This small town also has aspects which attract tourists. 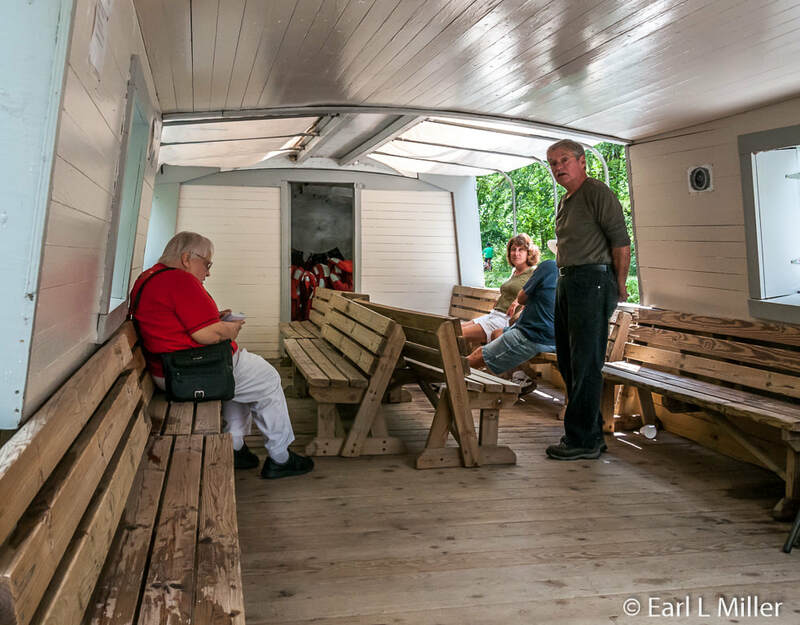 It operates the St. Helena III canal boat, holds an annual Ole Canal Days the second or third weekend in July for three days, has a small museum, a replica of St. Helena II, and a Hike/Bike Towpath Trail. The Center is a visitor and information facility built in 2006 and the place to buy your tickets for the boat ride on St. Helena III. Take time to watch their half hour movie on the canal “Our Canal Heritage” as well as look at the exhibits. 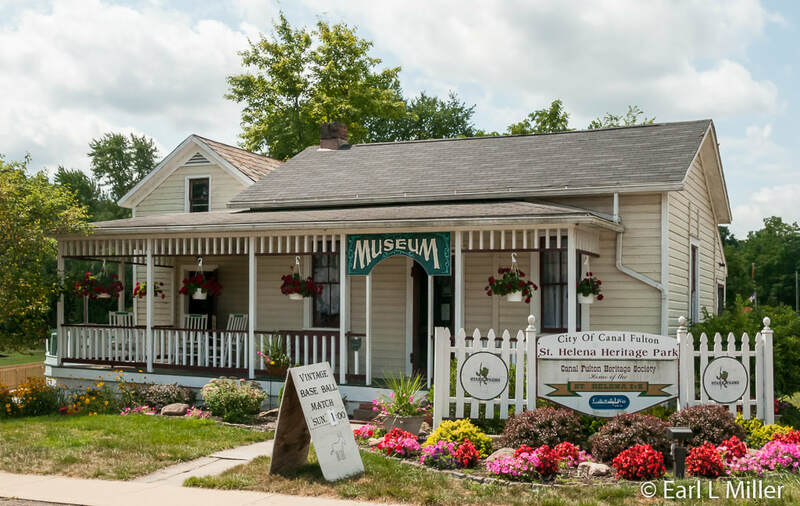 They have an excellent time line that traces the Ohio & Erie Canal’s history as well as information on Canal Fulton’s culture and area amenities in a brochure rack. You’ll find it located along the Ohio & Erie Towpath Trail in St. Helena Heritage Park at 123 Tuscarawas Street. It’s open seasonally. During May through September, hours are Monday through Friday 10:00 a.m. to 4:00 p.m. and on weekends 10:00 a.m. to 6:00 p.m. In April and October, it’s open weekends only from 10:00 a.m. to 4:00 p.m. The Center is closed the rest of the year. Their telephone number is (330) 854-6835. The boat is a replica of one that traveled the canal over 100 years ago. The first St. Helena was built during the 1850s at Newark, Ohio. It was used only for cargo. Made of wood, St. Helena II was the first authentically built canal boat built in the United States since the Ohio & Erie Canal era had ended. Her construction started in 1967. She plied the canal from 1970 to 1988 . Upon her retirement, she was given to the village of Canal Fulton. You’ll find this boat currently parked behind the Heritage House and Old Canal Days Museum. People are invited to go on board via a set of stairs around back. In 1992, rides on St. Helena III, a concrete boat, started. Her design is based on her predecessor. It runs at the maximum canal speed of four mph. These are narrated and a great way to learn about the canal’s history and Canal Fulton. Ron Reid, the historian on board, provided the narration. The boat, towed by two 1,900 pound Percheron horses, Dan and Willy, departs from in front of the Canal Fulton Canalway Center. 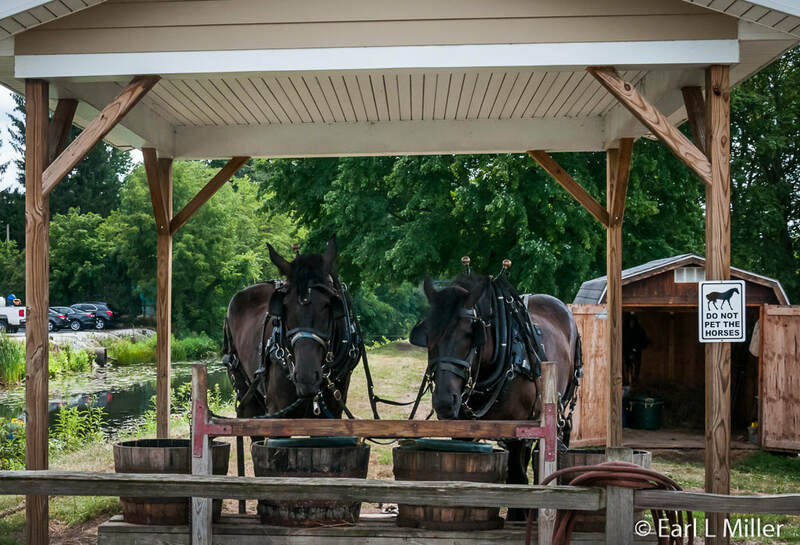 The horses, purchased from Amish farmers in Central Ohio, normally pulled heavy wagons so the boat is not too hefty for them to tow. While they can carry up to 60 people, the day we took it, less than a dozen were on board. The round trip is a 2-1/2 mile ride taking 55 minutes to travel. As we passed a low wrought iron bridge dated 1890, Ron called out “Low bridge.” This one was moved to its present site 50 years ago. The rest of the bridges were wooden and rotted away. We then glided by St. Helena Canal Fulton Park with its baseball field and picnic facilities. Sometimes teams dressed in vintage uniforms play ball there. Ron advised us to watch for wildlife. We passed a beaver dam, saw turtles resting on a log, and stayed on the alert for ducks, deer, and blue herons. Lots of fish, some two feet long, live in the canal. These include bass, carp, and sunfish. As we passed the remains of Lucas Underground Station, active between 1850 to 1861, Ron told us about how the canal helped runaway slaves. They hid in the canal boats to Cleveland where sailing ships offered passage to Canada. Northeast Ohio was heavily into abolition. You’ll pass the McLaughlin Dry Dock, a small site, where the St. Helena III is stored during the winter. The facility was constructed in 1830 and restored in 1976. It was used to build and fabricate wooden boats. At the halfway point, your boat will reach the Lock Four turning basin where the crew turns the boat around. In 1851-1852 the boat went through a lock which was 90 feet long and 15 feet wide. You don’t do that now. It was also a place for horses to rest and for the crew to sleep and have dinner and breakfast. You can see the brick lock tender house. It took ten minutes normally to go through. Sometimes boats waited in line for one to two hours. Packets had priority over other canal boats. The St. Helena III runs Tuesday through Sunday at 1:00 and 2:30 p.m. from June through August. During the spring and fall, it operates only on weekends at 1:00 and 2:30 p.m. The spring season starts in mid May while the fall season ends in mid October. Adults paid $8 in 2017. It was $7 for seniors (ages 60+) and veterans. Children’s fares for ages 6-17 were $5. Those ages five and under were free with a paying adult. You can visit this museum on a tour led by a volunteer. Our guide, Dennis Thornton, was excellent to work with. I was disappointed that the displays weren’t better marked since some cases didn’t have any labeling. Dennis informed me that the Canal Fulton Heritage Society, who runs it, has plans to redo the museum with more emphasis on the town rather than the canal. The museum consists of two buildings that have been combined. The smaller structure was once the carriage house for Dr. Hiram Dissinger, a prominent Canal Fulton doctor. It was later used as a rental dwelling and warehouse. Used today as office space and for collecting admissions, it is now owned by the Canal Fulton Heritage Society. The larger structure, containing the exhibits, was part of a complex of buildings. 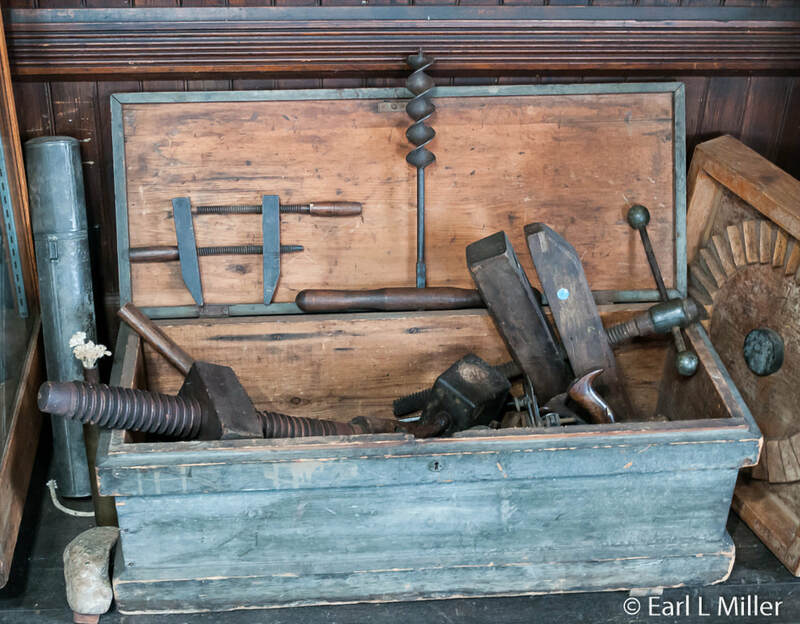 At various times, these served as a bakery, warehouse, dance hall, and the Live and Let Live Saloon. The former City Hotel was located where the two buildings are now. Originally built in 1835, it was noted as hosting three men who at one time were presidents of the United States: William Henry Harrison in 1840, John Quincy Adams in 1843, and James Garfield in 1850. Unfortunately, the building was razed in 1950. William McKinley and Grover Cleveland are also known to have visited the town. 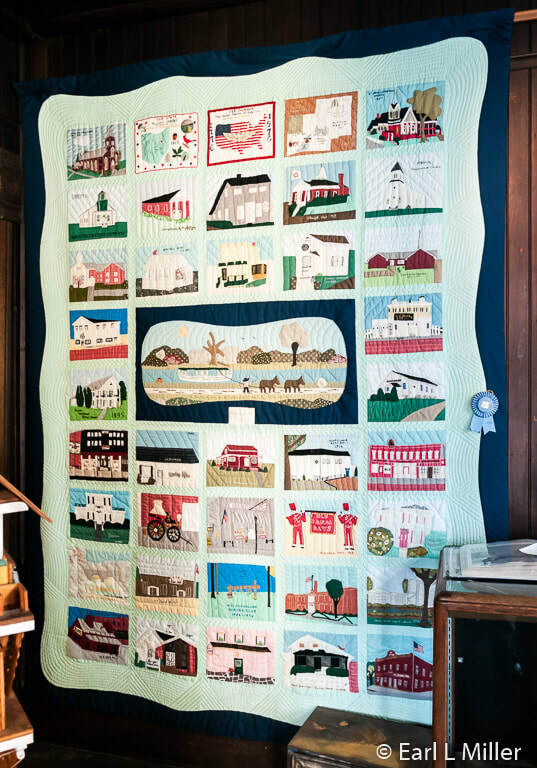 The Bi-Centennial quilt made by the local Piecemakers Quilting Club grabbed my attention. Its squares represent the United States, Ohio, Stark County, and many of Canal Fulton’s historical buildings. Some buildings are no longer standing. It won first place at the 1976 Stark County Fair and was pieced together by more than a dozen local women. In several cases, visitors find the types of tools used in building and repairing of canal boats. Examples are the caulking mallets used to waterproof boats. A picture shows how this was accomplished. Men used the mallets to hammer oakum (hemp rope dipped in tar) between planks of the boat’s hull. Two things made the boat water tight: the wood expanding when it got wet and the oakum in the cracks. You’ll find statues of canal workers and a list of canal boats that served the area. On the wall, check out the photos of private, packet, and freight canal boats. They include ones of life on board such as laundry day. Look for the sketch of the McLaughlin Dry Dock where repair and construction took place. It was McLaughlin who built a scale replica of the original St. Helena out of Newark, Ohio. His model is at Canton’s McKinley Museum. Plans for St. Helena II (located behind the museum) were derived from this boat model and a tintype photo of the original St. Helena. A large map depicts the Ohio & Erie Canal. It reveals the state’s topography and lets you see where each of the locks was located along the canal. It took five days one way by freighter and at least 3-1/2 days by packet to travel from Lake Erie to the Ohio River. It took many structures to allow boats to traverse the canal. Photos of some of the many locks, aqueducts, and culverts are shown. Locks were used to raise and lower boats along the canal. Aqueducts carried the canal over top of larger rivers where crossing the river was not possible. Culverts carried the canal on top of streams. At Summit Lake in Akron, there was a floating towpath to take the boats across the lake. The rest of the museum relates the history of Canal Fulton such as how Milan, Fulton, and West Fulton became one community. You’ll see programs of events such as Shakespeare, Uncle Tom's Cabin, and Rip Van Winkle at the Great Western Opera House which seated 500 people. Built in 1833, this six-story structure served as a grain warehouse. It was the tallest building of its time in Ohio. Its bottom floor also was a pharmacy, meat market, and saloon. In 1872, its top floors were turned into the opera house becoming Canal Fulton’s cultural center. The structure was destroyed by fire in 1930. You’ll also see several photos of the 1913 flood. A plaque on the porch railing of this building indicates how high the flood waters reached in town. Various aspects of early Canal Fulton life are represented. Look for the coal mining headlamps, the model of the 1873 steam powered fire pumper now on display at Canal Fulton’s fire station, and the model of the Baltimore & Ohio train depot. Trains started running through in 1869. Schools are not ignored. Visitors see a picture of the graduating class of 1901 and examples of the lessons they had. Another case holds dishes, arrowheads, and a fermentation crock. 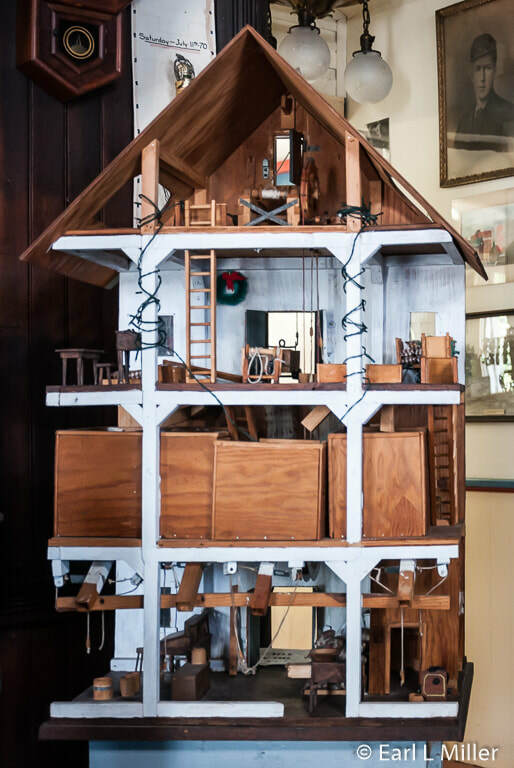 One of the highlights, a large model, depicts a grain warehouse. Our guide, Dennis, revealed that farmers would park their wagons in front of the building. A hook and pulley system lifted the wagon to the third flood to deposit grain into separate type bins holding corn, wheat, barley, oats, etc. When a canal boat pulled up beside the building’s rear, the chutes would open up, and the grain loaded directly onto the boats. The Heritage House and Old Canal Days Museum is open on weekends from noon to 4:00 p.m. when St. Helena III is operating. Admission is $2 for adults and free for children. It is located at 116 South Canal Street and their telephone number is (330) 854-3808. Interior of Canal Boat Nan is in red. Ron Mirfak is standing.